Many of us try to open doors for learners. Jesse Lee Eller, a trainer-teacher-learner whose instructional-design efforts always strive to keep learners front and center in the process, uses those doors in a somewhat different way: to create low-tech high-impact storyboarding maps that keep all of us who are working with him on track in our collaborative instructional-design efforts. Eller’s tools to sketch flexible first-draft storyboards of learning modules are wonderfully simple. He starts with a blank door in his studio/apartment, post-it notes, felt pens, and, when the process advances a bit, pieces of tape and large sheets of paper that most of us more frequently use as flip-chart paper with sticky backing. 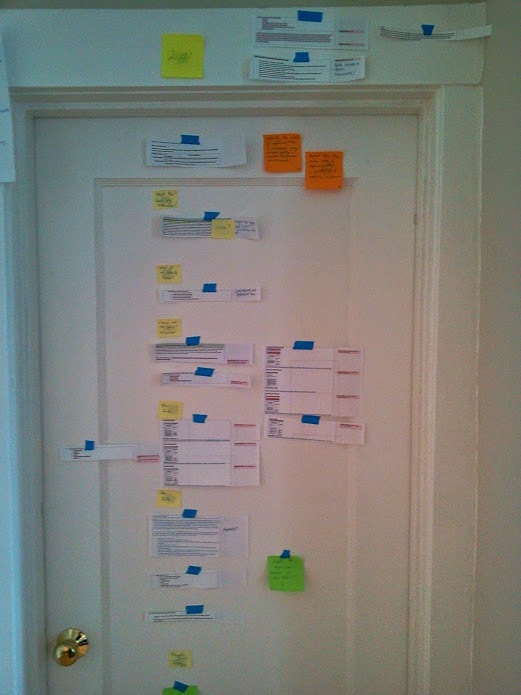 In the early stages of the process, he prints out text from Word documents provided by his subject matter experts, cuts the text into pieces that can be taped to his door to show where they will be incorporated into online lessons under development, and places post-it notes with questions he expects to address as he completes his part of the instructional-design process for online learning modules. Once he has arranged and rearranged the notes on a door, he begins to formalize and reassemble the map he is creating by transferring it onto the pages of flip-chart paper that are connected into a continuous top-to-bottom sheet to be hung on those same doors and shared with his instructional-design partners. Engaging with Eller and his instructional-design door hangings can be wonderfully stimulating. Where many of us understand and apply the guidelines that Gagné and others have provided, Eller’s questions and prompts continually remind us that we need to foster engagement with learners if we’re going to serve our learners well. Seeing that reminder to “Hook ME!” consistently reminds us that if we don’t immediately provide an engaging invitation to the learning experiences we are preparing, our learners will see our products as just another set of exercises to complete, set aside, and forget the moment they have completed a lesson. “Hook ME!” provides one of the most important reminders we can receive at any stage of learning development: we’re writing to an audience we need to keep in mind; that audience has plenty of competing calls for its attention; and we must be competitive in attracting members of that audience to what they, those for whom they work, and those they ultimately serve in their workplaces expect us to facilitate—meaningful, useful, and memorable learning experiences. It takes a bit of time to completely appreciate how flexible and useful Eller’s system actually is. Looking at the text and post-it notes on the doors throughout his studio immediately and implicitly reminds us that the early stages of storyboarding require lots of thinking and rethinking, so the convenience of being able to move blocks of text and comments on post-it notes around keeps us from locking ourselves into a specific plan of action too early in the design process. Moving those blocks of text, notes, and headings onto large sheets of paper that can be hung on doors or walls moves us a bit closer to developing a useable roadmap for the learning experiences we are crafting; it also proves to be amazing resilient as a way of making information available to others: collaborators working with Eller in his studio can easily contribute to the process by moving elements around on the sheets of paper; those who are responsible for transferring those rough drafts into PowerPoint slides to further finesse the storyboarding process can physically carry the rolled-up sheets to paper to their own offsite workspaces. And those of us who don’t have time to visit Eller’s studio to retrieve the rolled-up sheets of paper can access them through digital photos Eller quickly takes and forwards as email attachments. 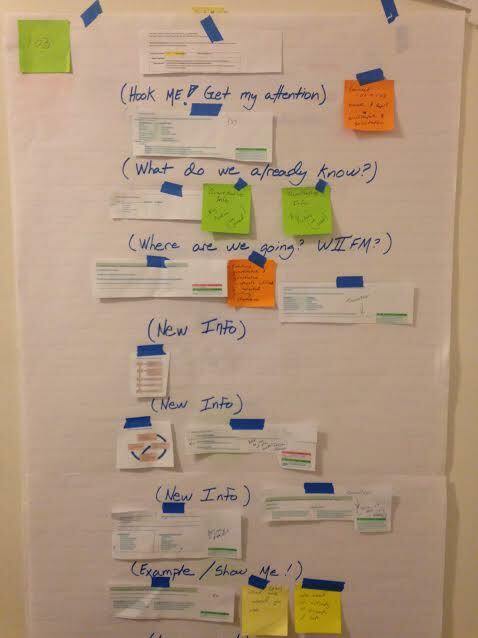 Having seen one of those door-hung maps and becoming familiar with the instructional-design process it represents, most of us can easily keep one sample in our own workspace and use it to format text provided by subject-matter experts for other learning modules. The door-hangings that Eller and those of us collaborating with him are using may not replace the posters, photographs, and artwork we hang to stimulate our creativity in our workspaces. But creating and developing those rudimentary and flexible storyboard templates upon our doors provides an effective reminder that doors to learning can be used in many different creative ways to serve our learners well. This entry was posted on Monday, June 2nd, 2014 at 5:12 pm and is filed under training. You can follow any responses to this entry through the RSS 2.0 feed. You can leave a response, or trackback from your own site.